Leslie was trained by Bob Proctor in 2000 to be one of his certified facilitators. 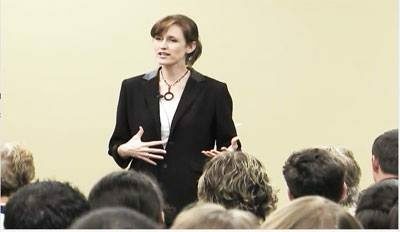 After that, she became an award-winning author of her own three best sellers, and has delivered over 50 presentations on the topic of Rare Faith (her unique angle on the Law of Attraction). Over the last twenty years, she has shared speaking platforms with several of the greats (including Brian Tracy, Bob Proctor, John Gray, and Dan Clark). If you’re interested in having her speak at your event, send her a message below. Currently, Leslie’s regular speaking fee for a 2-hour keynote is $3850. Under special circumstances, she speaks for less, and sometimes for free (but it has to line up with her existing trajectory, and it has to make sense). In short, she needs to be able to justify the prep time and time away from her family and other projects. Her time is limited, so if you spell everything out in your first message, she will be all the happier to consider it. Click here to send Leslie a message.